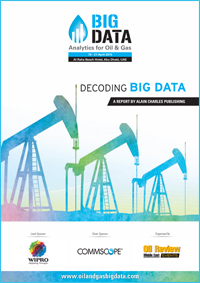 Download the technical report from the first Big Data Analytics for Oil & Gas Conference, highlighting how data can be mined and analysed to maximise value in the oil and gas industry. 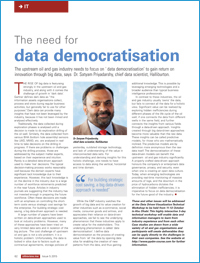 The upstream oil and gas industry needs to focus on ‘ data democratisation’ to gain return on innovation through big data, says Dr. Satyam Priyadarshy, chief data scientist, Halliburton. With the continuing uncertainty caused by the oil price collapse, many oil companies will have to revise their corporate strategy, focusing on core assets and cost discipline. 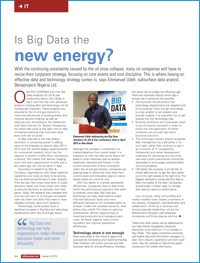 This is where having an effective data and technology strategy comes in, says Emmanuel Udeh, subsurface data analyst, Beneprojecti Nigeria Ltd.
One of the key challenges for oil and gas companies is how they can use vast quantities of data to optimise production in future oilfields, taking into account storage, processing and visualization techniques. 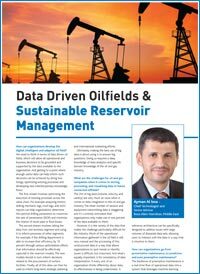 How advanced analytics can then be applied to reservoir management, drilling strategies and pre-emptive maintenance approaches are at the forefront of data utilisation. Ayman Al Issa, Chief Technologist and Senior Advisor at Booz Allen Hamilton, Middle East considers theses challenges and offers some useful insight. 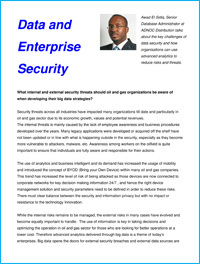 Data security is one of the biggest challenges in the oil and gas sector. Awad El Sidiq, Senior Database Administrator at ADNOC Distribution talks about the key challenges of data security and how organisations can use advanced analytics to reduce risks and threats. In an era of falling oil prices, big data analytics present opportunities to establish more efficient oil production, reduce costs and risks, improve safety, enhance regulatory compliance and foster overall better decision making. 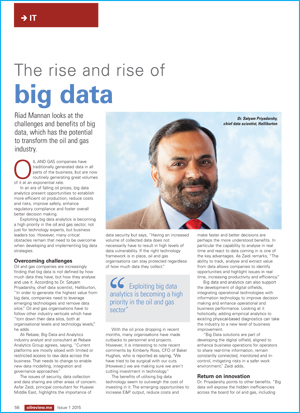 Exploiting big data analytics is becoming a high priority in the oil and gas sector, not just for technology experts, but business leaders too. 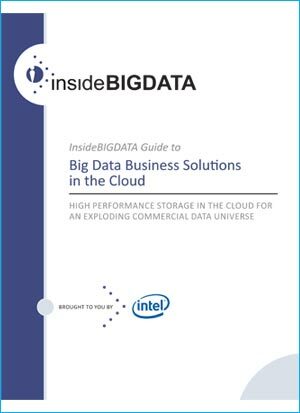 However, many critical obstacles remain that need to be overcome when developing and implementing big data strategies. This article outlines some of the main barriers and how to overcome them. 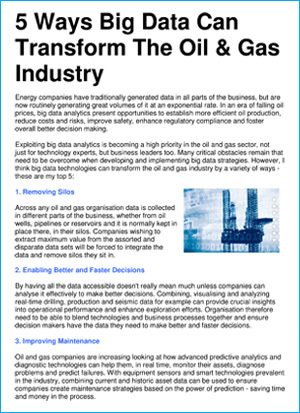 As leading energy companies fully utilise the data they already have and extensively put big data analytics at the core of their businesses, we look at the top 5 ways big data will transform the oil and gas industry. The Exploration & Production (E&P) organization requires lots of information and data (I&D) in order to make the right and accurate decision. Today’s technology has made it possible to obtain high quality information in real time but this has also increased the associated problems required to properly manage these information and data assets. 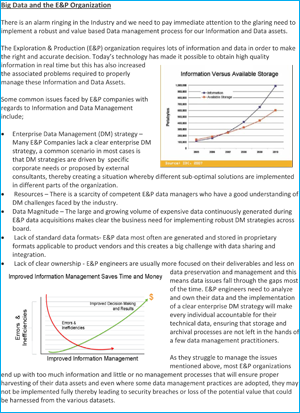 In this white paper, Emmanuel Udeh, Subsurface Data Analyst at Shell considers some of the common issues faced by E&P companies with regards to information and data management and sets out some guide lines to implement a secure and efficient I&D management system.